Flapjacks in all their forms are an intrinsic part of British baking. 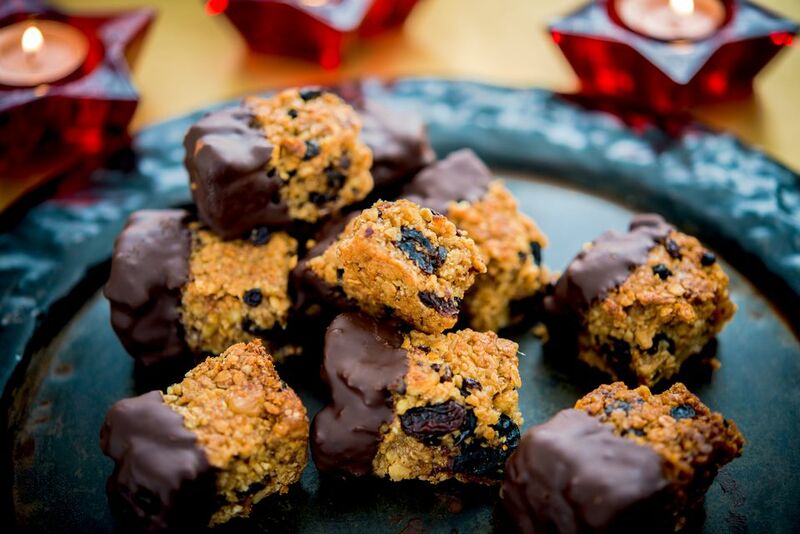 These delightfully chewy bars are made mainly of oats, dried fruits, and golden syrup, but you can add whatever else your imagination calls for. Here, they meet the warming spices and fruits of a British Christmas cake. Chunky Christmas Flapjacks are easy to make. Do not be put off by the list of ingredients, as they almost all go into the bowl together for a quick mix and just 25 minutes in the oven. Dip in chocolate if you wish and cut them into bite-sized pieces or small bars. The brandy is optional and should not be added if serving to children. The British version should not be confused with U.S. flapjacks, which are more akin to a pancake. Gather the ingredients and preheat the oven to 350 F/180 C/Gas 4. Lightly grease a baking tin measuring roughly 8x8-inch/20x20-cm) and at least 1 1/2-in/4-cm high. Line the bottom with greaseproof paper. Put the butter, caster sugar, and golden syrup into a large saucepan and slowly melt over a medium heat, taking care not to burn it. In a large, roomy baking bowl, combine the dried fruits, walnuts, ground almonds, spices, and both types of oats. Pour in the melted butter and sugars and stir well to make sure all of the ingredients are combined and covered with the sticky liquid. Add the brandy, if using, and stir again. Press the mixture into the greased baking tin, making sure it goes right into the corners and that, when finished, the surface is level. Bake for 20 to 25 minutes. Check the flapjack from time to time to make sure it is not cooking too fast. If it is over-browning too quickly, turn the heat down. Once baked, remove the tin from the oven and leave to cool for 10 minutes. When a little cooled, remove from the tin and cut into chunks or slices. Place the pieces onto a wire cooling rack and leave to completely cool. Meanwhile, break the chocolate into small pieces. Drop into a bowl and place over a pan of simmering, not boiling, water. Stir once it's melted, but take care to use a wooden spoonl warm melted chocolate does not like a cold metal spoon. Dip the ends of the flapjack chunks into the chocolate with as much or as little as you wish. Place back onto the cooling rack and once all are done, pop the cooling rack into the fridge and leave for the chocolate to set. The flapjack keeps well for several days if stored in an airtight tin, but does not freeze well.